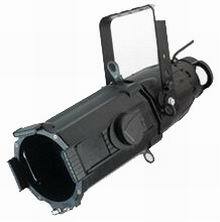 Conventional Fixtures A New source for zoom Profile Spot! Discussion in 'Lighting and Electrics' started by LekoBoy, Oct 5, 2008. ...Aaaaand someone else for ETC to sue the pants off of, hopefully. Oh, and check out how the fixture's upside down. Why don't people stop imitating and start innovating? It even uses the HPL Lamp..
Found the main website. Looks like lots of people might like to sue them to me. Of course they are in China so good luck with that. Hey, look! Their entire product line looks oddly familiar. Odd. I like their R&D page. "Our high quality R&D team goes abroad to learn the latest patterns every year. We also invite clients to work with us in researching and developing new designs. Experienced technicians use computers to design new styles. Thus, we can bring forth new styles every year. The customers designated designs and ideas about products or parts are also welcome." The product line looks more like they have a R&S department (Research and Steal). Hey ST or any of the ETC crew before we keep bashing these guys can you tell us if they have licensed the use of the HPL and your zoom design? OR is this a "I'm on the phone with my lawyer right now... no comment" sort of situation? Technician and Programmer-Performance Lighting Inc.
"Are you the First Chair Leko player?" "Our high quality R&D team goes abroad to learn the latest patterns every year." "Experienced technicians use computers to design new styles." I rather enjoyed viewing a S4 knockoff at a European show recently that was made from two right side castings rather than a left and a right. Presumably, the R&S guy managed to scrounge up an older S4 casting and began making others with it. When joining them together, however, the gel frame clip and accessory slot were oddly shaped. (Hmmm, go figger) as they were only half there. "Computers to design new styles"
Yes, you do need computers to photoshop the Company logo off of a fixture. This fixture is not licensed. Well then gentlemen BLAST AWAY at these ignorant thieves who can steal "the latest patterns" but don't know how to hang it right side up for a photo! and ST we wish you all best with the lawsuit. 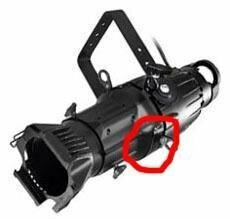 Actually Alex, the fixture has the remarkable feature of an accessory slot on both the top and the bottom. In fact, it's all one slot. 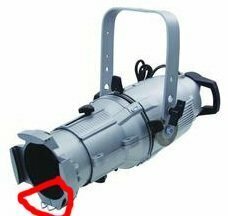 The only thing preventing a gobo holder from falling right though is the holder's handle, which means that the gobo is not centered in the gate, but that's a small price to pay for "innovation." The fixture even comes with a pattern holder that exhibits this anomaly. Perhaps the manufacturer expected every fixture to have a Goboram installed.